The Camelback sofa history starts in the late 18th century and comes from the design studios of Thomas Chippendale. As you know, Chippendale was an influential British furniture designer at that time and his style influence the industry even today. The Chippendale style, associated with different forms of furniture, was the first style to be named after a designer. The camelback sofa is a tried and true favorite of the ages and will become a centerpiece in your living room. According to Merriam-Webster Dictionary, a sofa is “a long upholstered seat usually with arms and a back and often convertible into a bed“. Her origin reflects the fact that people have been sitting for all of recorded history. 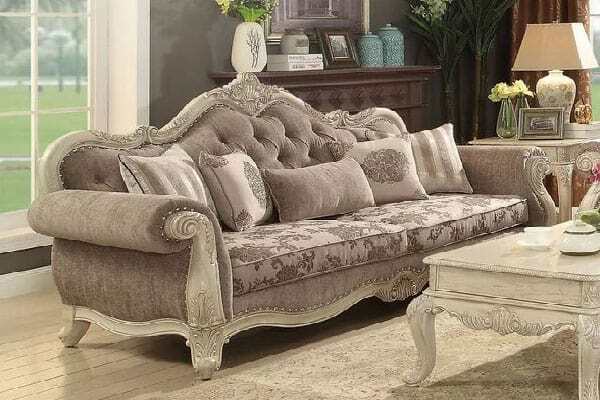 No matter if we choose to buy a sleeper sofas, a click clack sofa bed, a Chesterfield sofa, or whatever sofa style you like, these are probably the most essential pieces of furniture in any home. Fun Facts: you guessed it right – this piece of furniture it gets its name from the animal it resembles. The main characteristic is the arched middle and higher points at both ends. 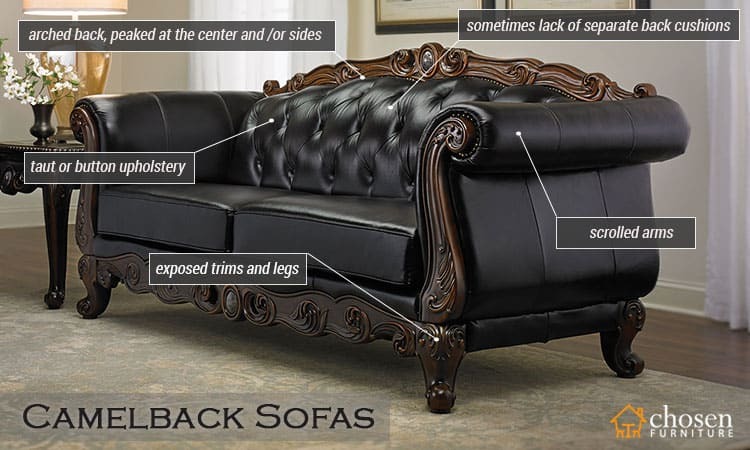 Modern versions of this sofas, called humpback sofas, may have only one or two humps. If you like to hold formal events in your living space and also need a comfortable sofa for daily naps, the camelback sofa will be a good choice. The traditional design of a camelback sofa and its timeless look makes this sofa a trendy option until today. Without a doubt, the authentic camelback sofa design has its own charm. 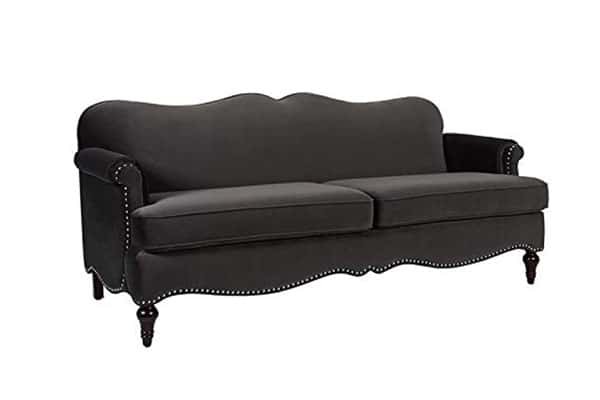 Its classic silhouette, anchored in elegance, features an arched back, peaked at the center and sides, exposed trims and legs, scrolled arms, taut or button upholstery, and sometimes lack of separate back cushions. You can use a camelback sofa slipcover to customize it with your favorite fabric and color, refresh the look of the place regularly, protect the sofa, and keep it clean all the time. Graceful wood legs along with decorative wood elements on the back and arms can be featured in this sofa type. Given the timeless popularity this furniture has accrued over the years, the market is now filled with camelback sofas in a wide variety of sizes, materials, prices and so on. For a rookie, choosing the best camelback sofa can be quite a challenge. The question then becomes – which one to buy? Here are some of the top camelback sofa models for everyday use – and we love them all. The Brika Camelback Sofa is a great addition to any living space if you like to add a bit of traditional flair. High-quality fabric wraps a solid wood frame made from kiln-dried birch which provides exceptional support, comfiness, and stability. His unique scalloped camelback design is accented with nailheads along the arms and bottom edge. Upholstered in woven fabric, with a top premium high-density flame-retardant foam – all these to offer a luxurious medium firm feel. Brika camelback sofa is an ideal choice for your living room, den, or office. With its lines, this 3-seater sofa brings class and lounging comfort to any room in the home. Some assembly required. If your couch is looking awful, switch things up with Folmar Settee Camelback Sofa. 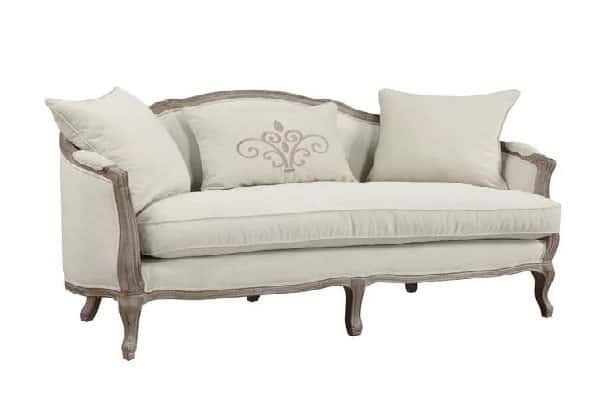 A piece like this is perfect for adding an aristocratic touch to your home, while still delivering much-needed seating. Wrapped in a linen-look microfiber, this piece features traditional accents like pad feet, a camelback, and carved arms, while the wood frame is finished with distressed paint for a rustic look. Perfect for daydreaming or working your way through Les Miserables, this French cottage-inspired piece features a down and fiber-blend cushion. The Ramsey Camelback Sofa by Jennifer Taylor Home will add excitement to your decor with its unique, modern, and upscale design. This camelback sofa will truly stand out in any setting area in your house. 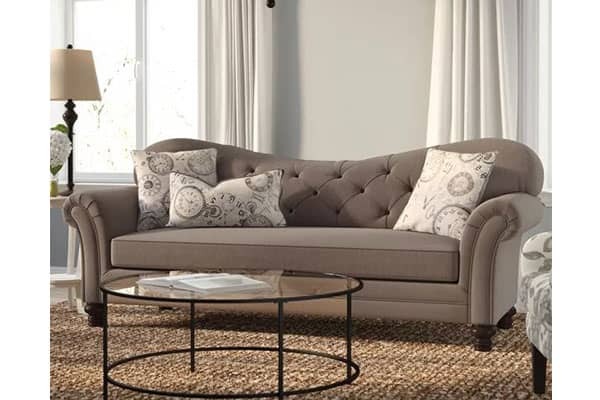 With its button tufted sloped arms and camelback backrest, tapered mocha finished legs, and large double seat cushions, the Ramsey sofa is one of a king among all sofa collections. High-strength sinuous spring suspension mounted for long-lasting comfort and support. Masterfully handmade by experienced furniture craftsmen and women. Only leg assembly required. Elegantly designed and rich in style, the Alexzander Leather Camelback Sofa is upholsted using Italian leather sofa and it will instantly upgrade your living room. This collection reflects completely classic and an elegant style, it is a must have for instant style elevation. 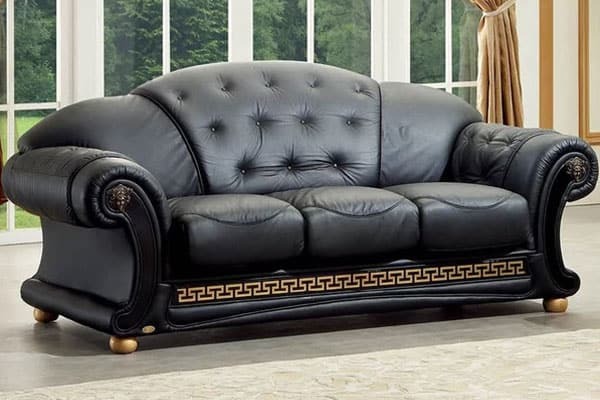 Crafted from the finest leather upholstery this sofa is complete with gold detailed trim, tufted details, plush seating and gold legs to complete the look. Flared rolled arms with decorative trims. Complete the wholesome look with a matching leather loveseat or an Alexzander armchair. Old World furniture collection from Ashley is irresistibly stylish and a comfortable place to chat and unwind. North Shore Leather Camelback Sofa features grand curves are softened with luxurious top-grain leather and three decorative pillows. Cushioning is firm and inviting, from the box seat to arching back and arms. Classical plumes and medallions highlight the exposed frame. Frame constructions have been tested with various equipment to simulate the home and transportation environments to ensure durability. Corners are glued, blocked and stapled. Seats and back spring rails are cut from 7/8 in hardwood. Stripes and patterns are match cut. Cushion cores are constructed of low melt fiber wrapped over high-quality foam. The cushions cannot be flipped as they have leather only on one side. Elegance comes in all types of structures and colors. 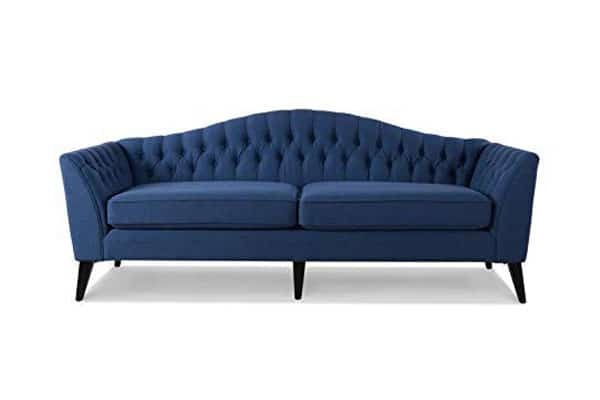 Emillio Camelback Sofa is a gracefully designed piece of furniture which features deep blue fabric that’s extremely soft to the touch, with nailhead trim to outline the curved frame, and a sturdy hardwood frame to last for years. The wide and singular seat cushion is carefully filled with Dacron-wrapped foam, no-sag springs, which can provide endless comfort for you and your guests. Two accent pillows are included for each piece, offering extra sophistication and detail to the already gorgeous appearance. Traditional design elements lend an air of refined relaxation to the Midwood Collection. 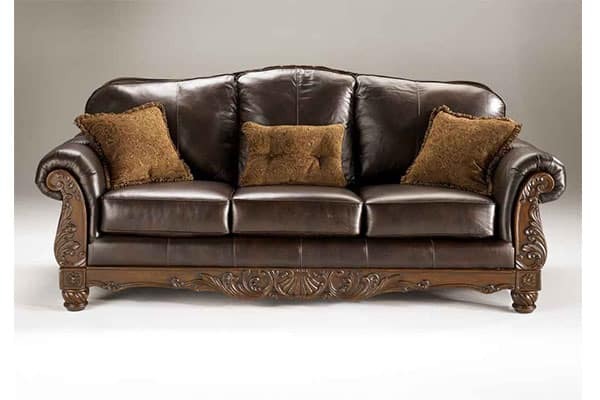 Rolled arms of Midwood Camelback Sofa design feature nailhead accent while the contrasting show wood routed frame accentuates the rich chocolate or dark brown bonded leather covering this camelback sofa. The seat and back cushions are not reversible. You complete your seating arrangement with matching Midwood loveseat. A refined take on the transitional style, with a lovely wood-frame, the Remmie Camelback Sofa instantly elevates your favorite seating space. Its diamond-tufted details add a sophisticated touch to your decor while its curved silhouette draws the eye to your room arrangement. Add it to a living room ensemble alongside a pair of wingback armchairs and complementing sofa for a cohesive arrangement, then accent the space with embroidered patchwork pillows for a touch of texture. Anchor the space with a pedestal coffee table, then top it off with a weathered wood lantern for a charming nod to the past. 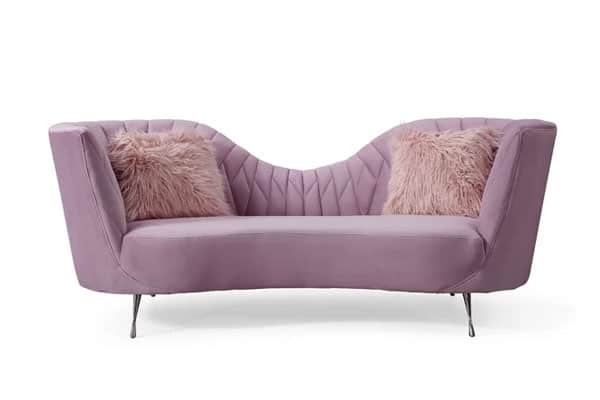 Perfect for seating guests at your cocktail party, or relaxing while reading a mystery book, this handsome design is a must-have addition to your home. Liven up your living room look with Alter Modern Camelback Sofa. Founded atop four angled legs, its frame is crafted from stainless steel and takes on an eye-catching curved silhouette. Foam padding lends comfort to the seat, while velvet upholstery wraps around to tie it all together with a solid hue and camelback. It offers space to seat up to four for cocktail parties and movie nights in. Hollywood glam takes on a whole new meaning when this camelback sofa makes its way into your home. Includes 2 matching faux sheepskin pillows. Handmade by skilled furniture craftsmen. Stylish stainless steel legs – only the legs of the sofa need to be attached. 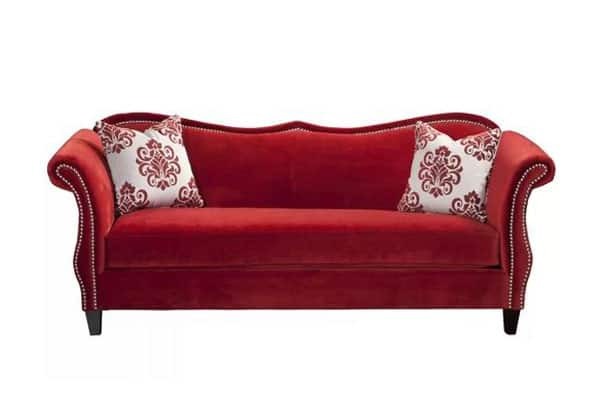 This Welling Camelback Sofa combines traditional details with functional design to accommodate today’s styles. 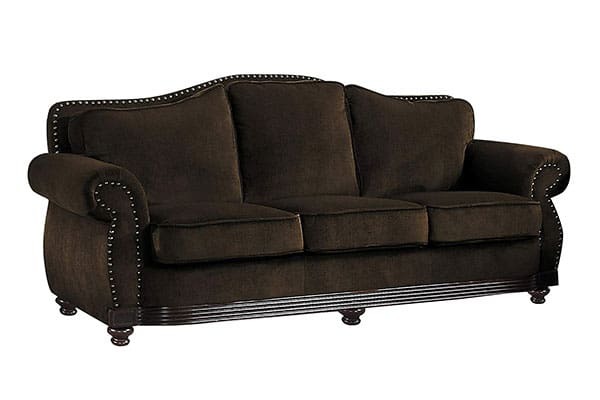 Features a tight back cushion, rolled arms, crown and raised scrollwork ornamental trim and button tufted backrest. Crafted from wood and polyresin along with fabric upholstery, this sofa exhibits a royal look and is sure to enhance the ambiance of your home space. Five accent pillows are also included to make your living room more splendid. Find a sense of comfort at the end of a hectic day and sink back into this camelback sofa. Seat construction with pocket springs. Always remember, with any Camelback sofa purchase, there is no need to rush into it. Take your time and read user feedback and be sure to trust your intuition. When you find the ideal look and price range of a camelback sofa for you, consider investing money into a high-quality product. Although there’s a variety of models to choose from, the ten Camelback sofas mentioned above are some of the best and most popular we’ve come across.